If you or your spouse had a critical illness, how might your priorities and current lifestyle change? Critical Illness Insurance helps cover the unexpected costs and potential loss of income associated with a serious illness. From the costs of medicine and treatment, to travel, specialists and home accommodations, treating and recovering from an illness can have a devastating financial impact. Plus, if you’re unable to work during your recovery, the impact is even greater. How the policy works is that if you are diagnosed with one of the listed covered conditions, the contract will pay out a lump sum benefit (tax free). It’s that simple.  There are variable pricing options of Critical Illness plans. A Term 10 plan offers the most cost effective choice for short term planning while still having the ability to convert to a permanent option. Permanent plans have a level premium for life with the option for a full Return of Premium if there are no claims made on the policy. With this option the policy holder has the option to cancel the policy any time after 15 years and receive 100% of their premiums paid. If you got seriously ill, is that the time to put your financial security at risk?